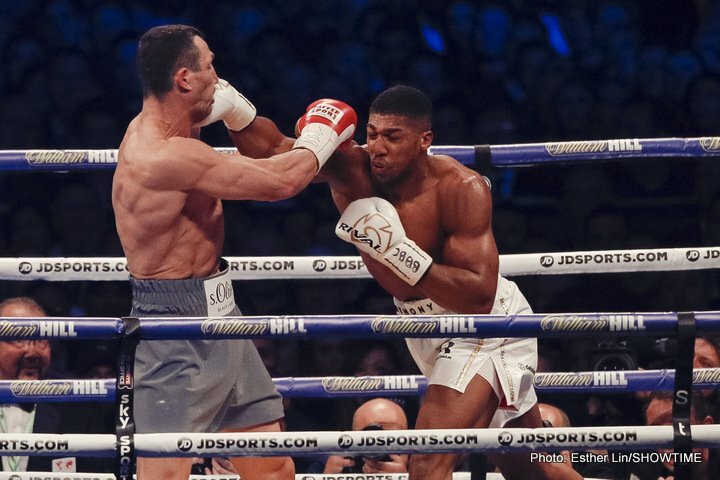 By Allan Fox: Wladimir Klitschko won’t be making a comeback to face Anthony Joshua in a rematch on April 13 next year at Wembley Stadium, in London, England. Joshua’s promoter created a lot of speculation recently when he mentioned that he has two “wildcard” options for Joshua to fight on April 13 besides Dillian Whyte, who is currently viewed as the favorite to get the fight. Unbeaten cruiserweight champion Olekander Usyk won’t be facing Joshua on April 13 either, according to his manager Egis Klimas. Usyk will face Joshua in good time, but not now. Klimas is talking about wanting to match Usyk against Andre Ward. That’s a fight that interests Klimas and Usyk. Wladimir’s manager Bernd Boente said that he’s not going to be coming back to face Joshua (22-0, 21 KOs) Joshua beat Wladimir by an 11th round knockout last year in April 2017 at Wembley Stadium. Wladimir did a bang up job in coming off of a 2-year layoff to almost beat Joshua at the age of 39. Wladimir (64-5, 53 KOs) looked like the younger and much higher skilled fighter of the two. Joshua was able to pull it out thanks to his crowd at Wembley Stadium. They were able to cheer him to victory when it appeared that he was done and on his way to a decision loss. “Not at all,” Boente said to skysports.com when asked if there was any truth about Wladimir making a comeback to fight Joshua on April 13. Wladimir knocked Joshua down in the 6th round of their fight last year, and had him within an eyelash of being knocked out. Hearn says the guy he wants for Joshua to fight on April 13 is WBC heavyweight champion Deontay Wilder, but he’s got a fight on December 1 against Tyson Fury. Hearn is taking a wait and see approach to that fight. Hearn would like to get the winner of the Wilder vs. Fury fight for Joshua to fight on the 13th of April, but that’s going to be a tough job. The percentage split that Hearn has been talking about for Wilder vs. Joshua has been embarrassingly lopsided in favor of his fighter. Joshua would get the lion’s share of the money for a fight against Wilder if it were to happen under the terms that Hearn has spoken about. Wilder likely won’t change his mind in accepting the smaller money for a fight against Joshua unless he loses to Fury.